The right quadriceps injury that might keep Kawhi Leonard sidelined through the preseason is a carryover from last season, writes Melissa Rohlin of The San Antonio Express-News. The Spurs issued a press release today explaining that Leonard is in a rehab program for quadriceps tendinopathy, with coach Gregg Popovich noting that the All-Star forward’s recovery has gone slower than anticipated. He added that it is not related to the ankle injury Leonard suffered in the playoffs. Thunder GM Sam Presti wrapped up an incredible offseason this week when Russell Westbrook signed a five-year, $205MM extension that ensures the reigning MVP will remain in Oklahoma City at least through the 2021-22 season. Presti also added two of the best available players on the trade market in Paul George and Carmelo Anthony to bolster a team that won 47 games last season. OKC’s new Big Three figures to be one of the top scoring trios in the league, and many observers believe the Thunder are the top challenger to the Warriors in the West. But now that Oklahoma City has its three stars, how long will they stay together? Westbrook will make more than $35.3MM next season when the extension kicks in, George is expected to opt out of a deal worth $20.7MM and become a free agent next summer, while Anthony has an early termination option on a nearly $28MM salary. ESPN’s Bobby Marks estimated that keeping all three would give the Thunder the first $300MM payroll, with $157MM going to salaries and $143MM in taxes. George seemed like a lock to opt out and sign with the Lakers, but he said Westbrook’s extension may give him a reason to stay in OKC. Anthony, who will turn 34 in May, is unlikely to find a better deal in free agency, although he could be planning to join his “Banana Boat” friends in Cleveland, Los Angeles or somewhere else. That brings us to tonight’s question: Will George and Anthony both be with Westbrook in Oklahoma City when training camp opens next year? Please share your thoughts in the space below. We look forward to your responses. Enjoying a fresh start in Cleveland, Derrick Rose admits to being in “a dark place” last season with the Knicks, relays Dave McMenamin of ESPN. Rose missed part of training camp because of a civil suit involving sexual battery allegations, then had a much-publicized disappearance in January when he missed a game without permission. His season ended early as New York shut him down in April with a torn meniscus in his left knee that required surgery. “By a dark place, I mean, I was playing, like, revenge basketball, and that wasn’t my way of playing basketball,” Rose explained. DeAndre Jordan‘s extension talks with the Clippers haven’t reached the point of discussing numbers yet, according to Broderick Turner of The Los Angeles Times. The 29-year-old center will make $22.6MM this year, then has a player option for 2018/19 worth $24.1MM. Jordan is heading into his 10th NBA season, which makes him eligible for 8% annual raises next summer if he stays with the Clippers. If he decides to opt out and re-sign with L.A., he could get more than $207MM over five years. If he goes to another team, he would be limited to four seasons with 5% annual increases. There’s no hurry to get a deal done, as the extension deadline isn’t until June 30, the day before free agency begins. Because he doesn’t have an agent, Jordan is handling his side of the negotiations. Jordan has been with the Clippers since being drafted in the second round in 2008. The team has expressed a desire to finalize a new deal to continue that relationship. After signing with the Pelicans earlier this week, Martell Webster has decided to leave training camp and retire from basketball. Webster was in camp on a non-guaranteed contract, so the Pelicans won’t owe him anything. New Orleans had the maximum 20 players in camp, so Webster’s departure creates an opening. Now 30, Webster hadn’t played an NBA game since undergoing surgery in November of 2015 to repair labrum and cartilage damage in his right hip. He played 32 games for the Wizards during the 2014/15 season, but the team waived him after the injury, which was believed to be career-threatening. The Trail Blazers selected Webster with the sixth pick in the 2005 draft, and he spent five years in Portland before being traded to Minnesota. He was with the Wolves for two seasons and the Wizards for three. Anthony Morrow has apparently taken an early lead in the fight for the Blazers’ 15th roster spot, Joe Freeman of The Oregonian reports. Morrow received a one-year, non-guaranteed contract prior to training camp and is battling Archie Goodwin and Isaiah Briscoe for a spot on the opening-night roster, Freeman continues. After four days of training camp, he’s already impressed coaches and teammates with his shooting, leadership and positive attitude, Freeman adds. Luke Adams took a closer look at Five Notable Free Agents still looking for jobs with training camps in full swing. Our weekly mailbag answered questions on Carmelo Anthony‘s impact on the Thunder and the Knicks’ chances of shedding Joakim Noah‘s contract. Our Offseason in Review series examined the Lakers, Suns, Pelicans, Raptors and Hornets. We conducted polls for the win totals of the Grizzlies, Pistons and Pelicans. We also asked our readers to decide which team is the Warriors’ biggest threat this season. Our Contract Extension Tracker is the best way to follow all the players who are eligible to receive extensions this fall. If you don’t have it already, be sure to download the Trade Rumors app for iOS/Android and give it a try. 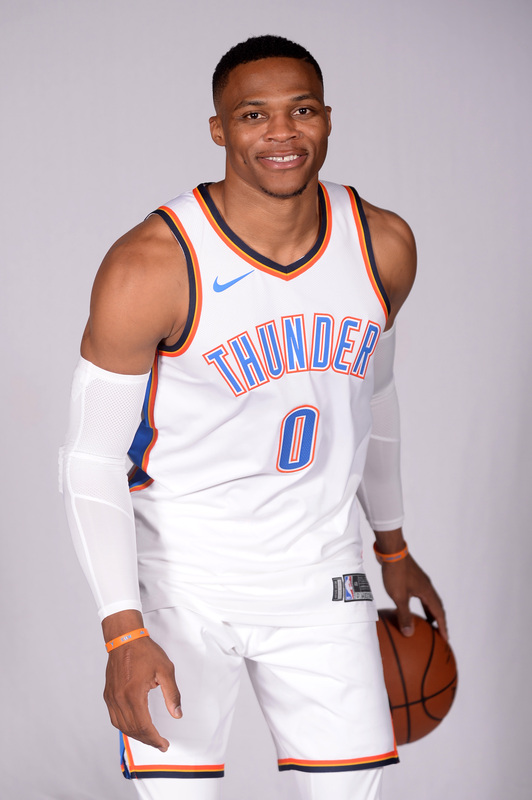 The Thunder signed last season’s Most Valuable Player, Russell Westbrook, to a five-year extension worth approximately $205MM. The contract agreement ends any speculation about where Westbrook will be playing in the near future. Westbrook’s new deal is a Designated Veteran Extension, similar to the ones signed by Stephen Curry, James Harden, and John Wall earlier this offseason. Not only is Oklahoma City committed to Westbrook, he also showed faith in the franchise that it will remain a championship contender in the coming years. It sends a clear message to Paul George that if he and Westbrook mesh well, there’s no reason for him to bolt to Los Angeles as a free agent next summer. The league’s Board of Governors approved major changes in the draft lottery system, beginning in 2019. Commissioner Adam Silver has been seeking ways to discourage tanking and hopes that lottery reform will help achieve that goal. Under the new system, the teams with the three worst records will have an equal chance at getting the top pick. Teams that get unlucky in the lottery could slide down as many as four spots instead of a maximum of three under the current rules. Dwyane Wade signed a one-year contract with the Cavaliers after reaching a buyout agreement with the Bulls and clearing waivers. Wade rejoined forces with his old Heat pal LeBron James in pursuit of another title. Wade left roughly $8MM of the $23.8MM he was due to receive this season on the table in order to complete the buyout, then signed for approximately $2.33MM with the three-time defending Eastern Conference champions. Suns big man Alan Williams underwent knee surgery and will miss most of the season. Williams is projected to need six months to return from the meniscus tear in his right knee. Williams, who signed a three-year deal worth just over $17MM this summer, suffered the injury during a workout. Restricted free agent power forward JaMychal Green finally came to terms with the Grizzlies. Green, who emerged as a starter last season, agreed to a two-year contract worth in excess of $17MM. Green’s agent has said early in the free agent process that he was exploring offer sheets and sign-and-trade scenarios, but nothing materialized and his client wound up right back where he started. Hawks starting point guard Dennis Schroder was arrested on a misdemeanor battery charge. Center Willie Reed filed a $13.5MM arbitration claim against agent Andy Miller. The Nuggets exercised their options on five players, including guards Emmanuel Mudiay and Jamal Murray. Carmelo Anthony thought he would be a Rocket before the Thunder acquired him. The Kings extended the contracts of GM Vlade Divac and coach Dave Joerger. Suns forward T.J. Warren signed a four-year, $50MM extension. The Bulls re-signed power forward Nikola Mirotic to a two-year, $27MM contract. Nuggets big man Kenneth Faried expressed unhappiness with his projected backup role. The NBA released its salary-cap projections for the next two seasons. Pacers swingman Glenn Robinson III suffered a severe ankle sprain in practice and is expected to miss two months. Kawhi Leonard is in a rehabilitation program for right quadriceps tendinopathy and is expected to miss the 2017 preseason, the Spurs announced in a press release on Saturday. Leonard battled a troublesome right quad toward the end of last season and was hampered by a right ankle injury in the playoffs. Despite the injuries, the defensive specialist played in a career-high 74 regular season games averaging 25.5 PPG, 5.8 RPG, and 1.8 SPG. The 26-year-old came in third place for the NBA Most Valuable Player award, behind winner Russell Westbrook and James Harden. Rudy Gay‘s season in Sacramento ended abruptly last season due to a torn left Achilles tendon. After declining his $14.2MM option for 2017/18, Gay signed a two-year pact with the Spurs looking to reestablish himself. Early indicators for the 31-year-old are positive, Tom Osborn of San Antonio-Express News writes. Gay has a career average of 18.4 PPG in 11 NBA seasons. If he can regain his pre-injury form for the Spurs, San Antonio will have another productive scorer in their lineup. A scorer that Green compared to Kevin Durant due to his ability to quickly shoot the ball. The Mavericks view their first-round pick, Dennis Smith Jr., as their guard of the future but taking on the lead in the backcourt may be too much in his rookie season. Eddie Sefko of Dallas Morning News writes that coach Rick Carlisle will rotate Seth Curry, Yogi Ferrell, and J.J. Barea alongside Smith in the backcourt. Earl K. Sneed of NBA.com writes a similar story, noting that Carlisle is considering having two point guards in the backcourt at times to play at a quicker pace. NOLA.com’s William Guillory hosted his latest mailbag, most notably answering one question about the Pelicans’ end of the game lineup will include Anthony Davis, DeMarcus Cousins, Rajon Rondo and Jrue Holiday. Ronald Tillery of The Commercial Appeal writes that Grizzlies coach David Fizdale was unhappy with the team after a recent practice. Fizdale now wants to implement a style where the team plays at an increased pace.